We received some calls about incidences of high populations of alfalfa weevil during the last couple of weeks. Our field scouting showed that populations of alfalfa weevil varied across the alfalfa production areas in the state. The UA Cooperative Extension Field Crops IPM Program conducted multi-year research to investigate alfalfa weevil thresholds. Our results indicated that an action threshold of an average of 2-4 large larvae per sweep justifies the application of control measures. This threshold can be dependent on hay price and cost of treatment. 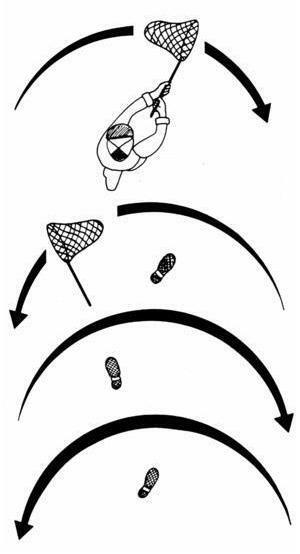 Sweep net samples should be conducted in at least 4 areas in the field (5 sweeps / area). It is important to use the proper monitoring methods for alfalfa weevils to determine their threshold levels. Using the right pattern for sweep net sampling is equally important. After many observations of sweep net sampling techniques in alfalfa, we’ve noticed that different “swing patterns” resulted in different insect pest counts. The economic thresholds we use to monitor and justify treatments for alfalfa insect pests are based on 180° sweeps. Using other sweeping techniques may give different results and may lead to either spraying too late or unnecessary spraying. As stated earlier, this threshold is based on counting large alfalfa weevil larvae. Remember that alfalfa varieties with rapid spring growth may be more tolerant of weevil damage and early harvesting can mitigate damage. 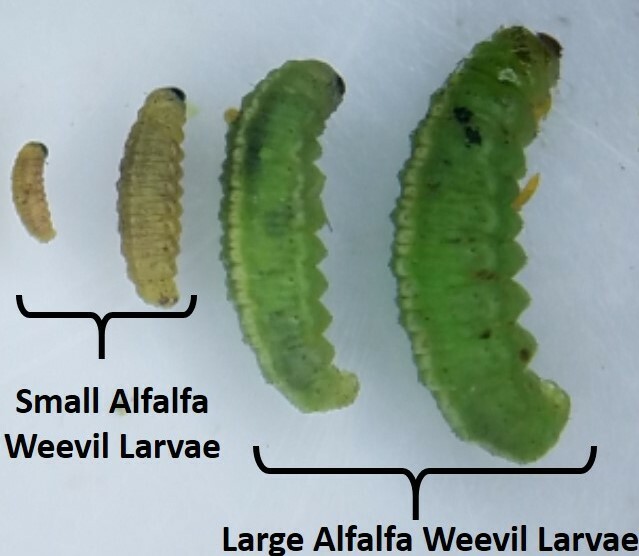 It is important to note that surviving larvae under windrows may reduce subsequent alfalfa growth. With the rain events we had during the last few weeks, I have received questions about rain impacts on alfalfa hay yield and quality. Alfalfa must be dried or cured for safe storage as hay, and generally we do not have problems reaching this dryness in Arizona. Normally, field and harvesting losses of hay are as high as 20 to 30% due to cutting and curing. Rain can increase these yield losses and reduce quality. The event of rain that occurs between the time forage is cut and baled extends curing time. Consequently, yield and quality are decreased, reducing the value of the crop as an animal feed and marketable commodity. Weather-induced losses can be caused by: 1) increased and prolonged plant respiration that reduces soluble carbohydrates and the overall energy content of forage, 2) leaching of soluble carbohydrates, protein, and certain minerals, 3) leaf shattering and loss, removing the highly digestible and high protein portion of the forage, 4) microbial activity that metabolizes soluble carbohydrates, reduces forage energy content, and possibly produces harmful mycotoxins, and 5) color bleaching. In a Utah study, artificial rain of 0.8 inches resulted in estimated yield loss of 9.7%, losses of available carbohydrate by 18.8%, 10.2% reduce of crude protein, 19.8% of lipids, and 14.0% of soluble minerals. Hay quality was reduced more by rain damage than by advancement in maturity. In a study in Michigan to examine the effects of rainfall on field cured alfalfa, dry matter (DM) losses ranged from 4-13% with rainfall intensity that was kept constant at 0.7-inch but spread over periods of 1 to 7 hours, with highest losses occurring when the rain was spread over a longer duration. Carotene, the precursor for Vitamin A, is sensitive to prolonged field exposure. Vitamin A is the most common vitamin deficiency in beef cows and horses. Fonnesbeck, P.V., M.M. Garcia De Hernandez, J.M.Kaykay and M.Y.Saiady (1986) Estimating yield and nutrient losses due to rainfall on field-drying alfalfa hay. Animal Feed Science and Technology, 16: 7-15. Rotz, C.A. (1995) Loss Models for Forage Harvest. Transactions of the ASAE. 38: 1621-1631. With the cooler temperatures of fall and optimum planting times for alfalfa approaching, winter weeds will soon be germinating in established alfalfa fields. It is human nature to think that winter weeds germinate later in the year because that is when they are large and visible along roads and in fields. In reality, they germinate earlier than we often realize. Now is a good time to be thinking about preemergence herbicide options for established alfalfa fields. Some winter weeds such as common groundsel (Senecio vulgaris) are toxic while others impart off-flavors to milk when fed to dairy cows. Apply preemergence herbicides to alfalfa fields shortly after cutting and removal of the forage. This minimizes the amount of preemergence herbicide bound to leaf and stem surfaces and the loss of weed control this causes. Some preemergence herbicides such as Chateau, Velpar AlfaMax Gold, diuron, hexazinone and metribuzin have contact-burndown activity if mixed with an adjuvant such as a surfactant or a crop oil concentrate. To avoid alfalfa damage do not mix them with these types of adjuvants. Imazethapyr (Pursuit) has both preemergence and postemergence activity and is selective in alfalfa. Other preemergence herbicides such as norflurazon (Solicam), EPTC (Eptam), Prowl H2O, and trifluralin granules do not have significant foliar activity. Velpar AlfaMax Gold, diuron, hexazinone and metribuzin are mobile enough in soil that in warm conditions alfalfa can absorb enough herbicide into the roots with soil water to cause injury (see labels). Chateau, Prowl H2O and trifluralin granules have very limited mobility in soil, just enough to control weeds. Observe the pre-harvest intervals on herbicide labels to avoid illegal residues in the harvested forage. There will always be weeds that escape preemergence herbicide applications so you may need to spray a postemergence herbicide later in the fall. Be sure to consider potential crop rotations and plant-back intervals when using soil active herbicides. Tickes, B. and M.J. Ottman. 2008. Alfalfa Weed Control in the Low Deserts of Arizona. https://extension.arizona.edu/sites/extension.arizona.edu/files/pubs/az1266.pdf. Accessed September 26, 2017.